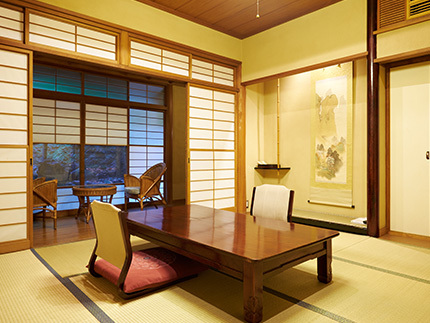 Ryokan - a Japanese style inn, is not only a great place to stay overnight while travelling within Japan, but also an excellent place to experience the truly relaxing pleasures of tradtional Japanese lifestyle. 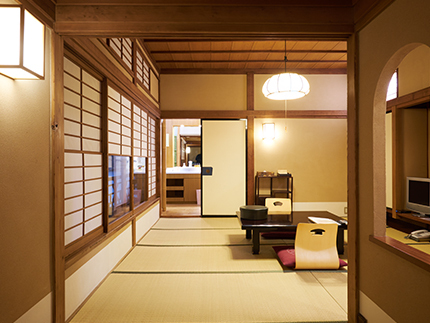 We are proud to offer various types of guestrooms in Japanese style to suit your taste. 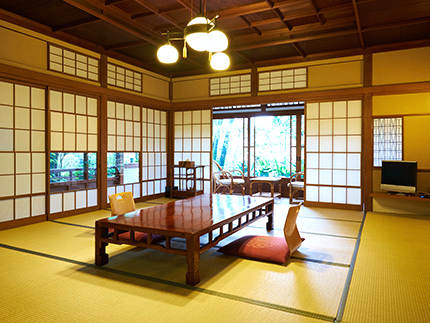 Such as old-style rooms made of precious woods or rooms with an open air bath. 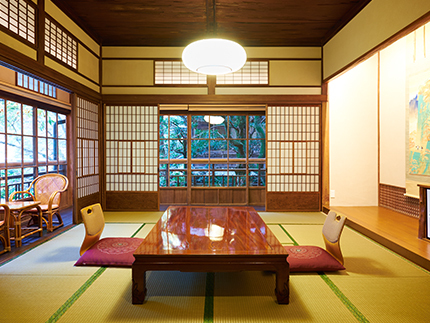 In the room of Traditional Sukiya Architecture, the lighting of the room is controlled by natural light and uses antique lighting at night. The Inn is also along the side of a stream. You can refresh yourself with sounds of stream and the negative ions that are omitted. 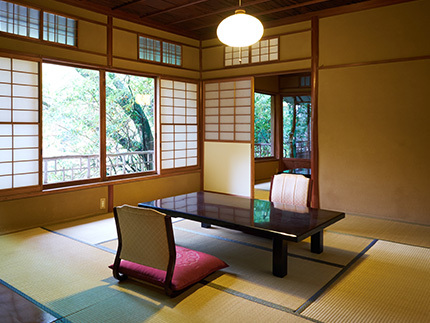 Th services of Ryokan include breakfast and dinner is usually included. Dinner will be one of the most memorable experiences of staying at Ryokan. With a private bath room of hot spring in Kakenagashi (not-recycled) style, including a toilet room. Yuzaka mountain view room. 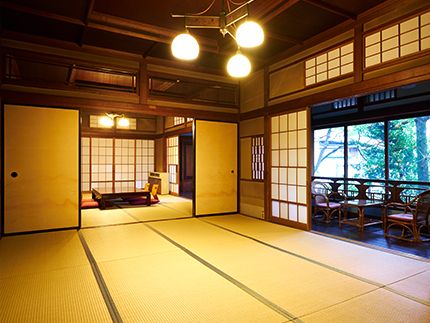 Vestibule and Main rooms (8 Tatami mat size: approx 3.5m x3 .5m or 11.6 x 11.6 feet) For 2 - 4 people. A quiet room on the mountain side of the Inn. A wide room with a river view and a veranda, without a toilet. Please use the shared toilet on the same floor. 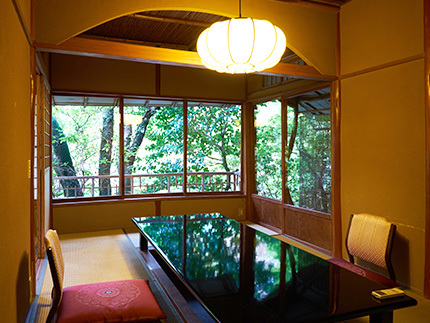 There is a connecting room and a main room (30 tatami mats) suitable for 12 people. A room with a private hot spring bath in Kakenagashi style (non-recycled water), a river view with a veranda and a toilet. This is a corner room on the 1st floor. 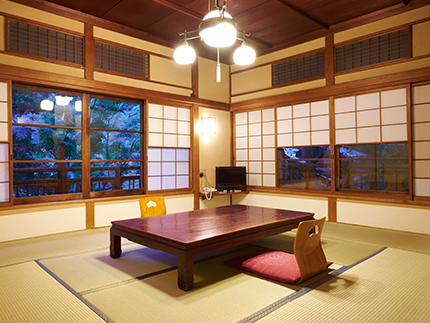 There is a connecting room and a main room (9 Tatami mats) suitable for 4 people. 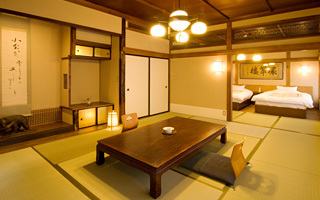 A room with a private hot spring open air bath in Kakenagashi style (non-recycled water), a toilet and mountain side. 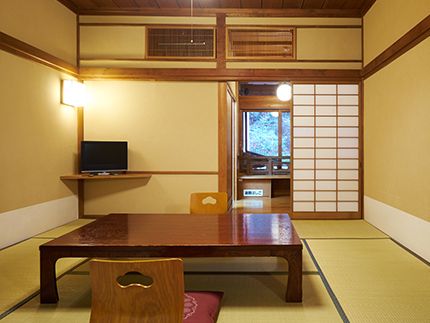 There is a connecting room and a main room (8 tatami mats), next room(4.5 tatami mats) suitable for 5 people. To make reservations for rooms in these private buildings, please e-mail us. 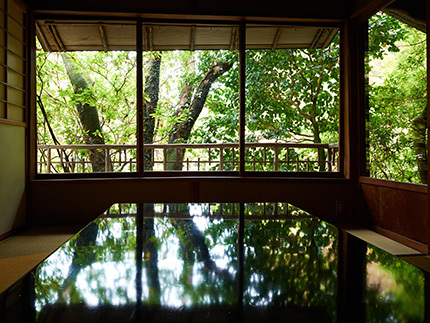 With a private bath room of hot spring in Kakenagashi (not-recycled) style, a river view with a veranda and a toilet. Connecting room and a main room (12 tatami mats). For 5 people. A room with a river view and a toilet, also with 2 beds of semi-double size. 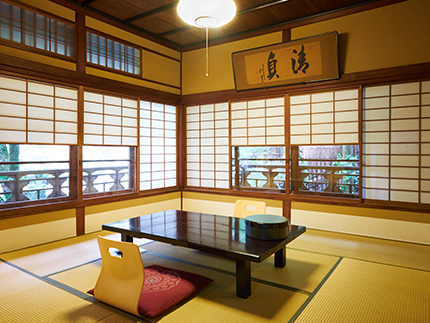 This is a Japanese modern-style corner room. The view from this room is said to be the best in our main building. 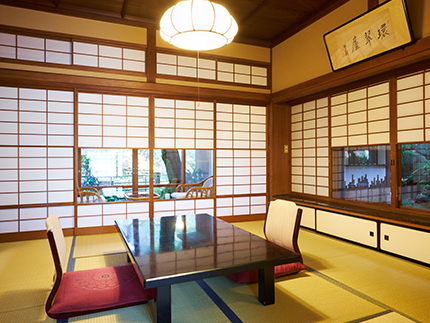 There is a main room (10 tatami mats) suitable for 6 people. *Beds are limited to 2 people with futons provided for other guests. A room with a private wooden bath, a river view and a toilet. This is special accommodation separated from the main building and with a view of the river from every window of this cottage. 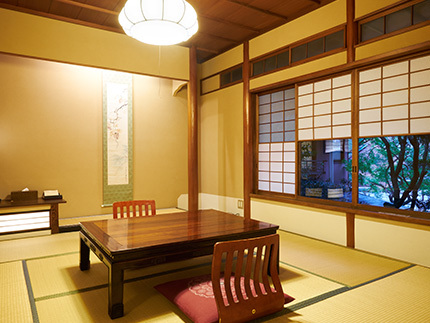 There is a vestibule, a dining room, a room with 7 tatami mats and a main room with 9 tatami mats, suitable for 7 people. 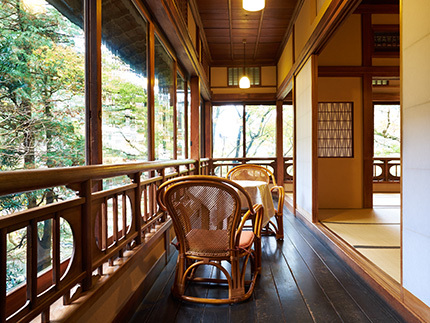 Rooms are all in Japanese style and basically composed with a vestibule, main room(s), and a veranda and a toilet room. In the main room, you are to sleep and have dinner. While your staying, our staffs come to your room for the following services. - We serve the Japanese tea in your room when you arrive. - We bring dinner to your room. - After the dinner, we prepare Futon mat in your room. - In the morning, we fold up Futon. - We bring your breakfast. Bedding facility at our Ryokan is only Futon mat. No western style bed is available. 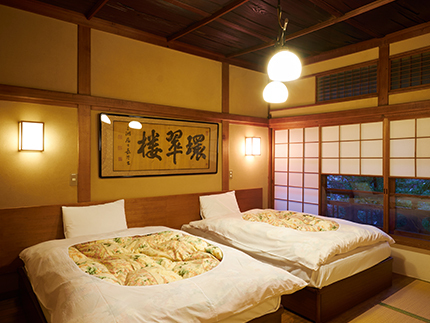 At night, we come to your room and prepare your Futon on a Tatami floor for you. Most of our customers go and take a hot spring bath while Futons are being prepared. In the morning, we also come to your room to fold up and put away all Futon. For your valuables, we provide a bag in your room. Please make sure to put all your valuables in the bag, and leave it at the front desk during your stay, as there is no safety box in the room.